Ar. furn, OCat ffoch, Eng. brick oven. It was a vault shaped large oven resting on a stand or on the floor used instead of a tannur. Several types of breads, dishes and sweets have been baked in it. A brick oven can be a communal oven. It is said that ovens were first built in the Orient and introduced to Europe around 170 B.C. 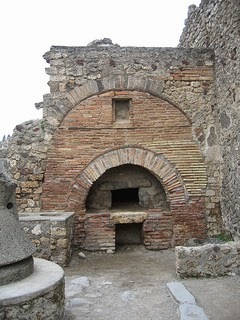 At first, the primary use of an oven was for baking bread. See tannur. Melt the ghee, stir it into the flour with a fork until there are only very small lumps. Stir in the milk until thoroughly mixed, knead briefly. Put the ball of dough in a bowl covered by a damp cloth and leave for at least an hour. Then knead the dough until it is smooth and elastic, adding a little extra flour if necessary. Take a ball of dough about 2" in diameter, roll it out to about a 5" diameter circle. Cook it in a hot frying pan without grease. After about 2 minutes it should start to puff up a little in places. Turn it. Cook another 2 minutes. Turn it. Cook another 2 minutes. It should be done. The recipe should make about 11 of these. Take a ball of dough about 3" in diameter. Roll it down to a circle about 7" in diameter and 1/4" thick. Heat a baking sheet in a 450° oven. Put the circle of dough on it in the oven. Bake about 6 minutes; it should be puffing up. Turn it over. Bake about 4 minutes more. Take it out. The recipe should make about 5 of these. 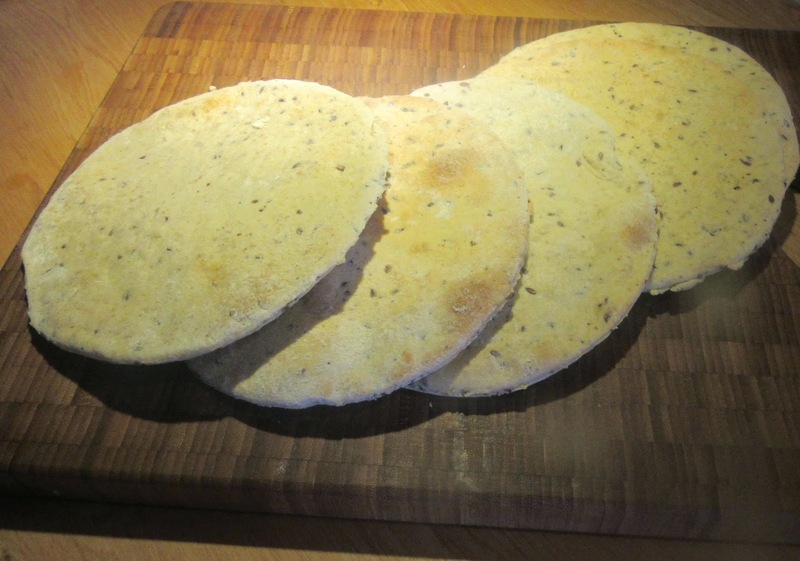 “There is a large kind, baked in an oven, made of 10 s flour: 5 s. Milk: 1 ½ s. ghi: ¼ s. Salt. They make also smaller ones. The thin kind is baked on an iron plate. One ser will give fifteen, or even more. There are various ways of making it; one kind is called chapati, which is sometimes made of khushka; it tastes very well when served hot.